One of the most interesting of the unusual locks manufactured during the early part of this century is the "Locking Clamp." For its time, it was probably one of the most versatile locks ever invented. The inventor was not limited in his imagination when describing its many uses. This diversity of uses has led to many arguments among collectors as to its proper use. This is one case where everyone is right. The first patent for a locking clamp was issued to L. C. Tingley of Providence, Rhode Island on March 26, 1912, Patent No. 1,021,343. Tingley's basic patent did not achieve much success as his imagination was limited. He could envision the clamp used only as a towel bar clamp or for robe and garments when left in an automobile. This lock operated with a rachet mechanism to close and a standard bit type key to release. The key enters from the side of the base. A few years later John Clayton Backus of the Backus Novelty Co., Smethport, Pennsylvania acquired the rights to the Tingley clamp. He then proceeded to re-invent the ultimate clamp. This much-improved locking clamp was issued Patent No. 1,156,739 on October 12, 1915. The success of the Backus clamp lies in the imagination and promotion skills of its inventor. In his patent papers Backus illustrates several uses and lists many more in his text, everything from the original towel and garment clamp to an automobile radiator core clamp. Among his more interesting applications was a spark lever and throttle lock. 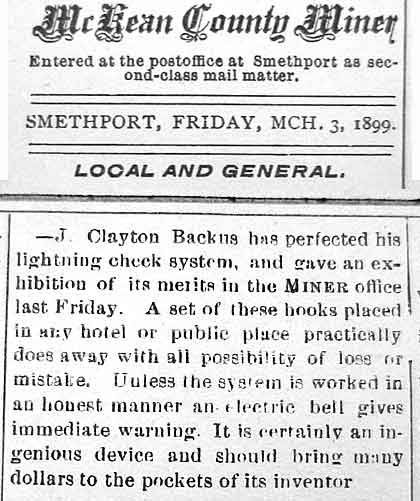 --J. Clayton Backus has perfected his lightning check system, and gave an exhibition of its merits in the Miner office last Friday. A set of these hooks placed in any hotel or public place practically does away with all possibility of loss or mistake. Unless the system is worked in an honest manner an electric bell gives immediate warning. It is certainly an ingenious device and should bring many dollars to the pockets of its inventor. Although announced in 1899, these locks were not manufactured until 1906. The production lock was purely mechanical, with no electric warning bell.